We still need your help. This am we identified 500 more kids that need toys. Volunteers needed in Garfield 11-4 to help sort & distribute. Drivers needed to be on-call during these hours. At least one trip from Waterfront to Garfield around 5 PM. – Toys & Gifts for Kids Ages 6-12, all types. We are very low and have to serve over 300 kids in this age range. – Gift bags for our craft kits from Creative Reuse. We need 50 bags that are at least 8 x 11 and 50 smaller sized bags. We prefer gender neutral, non-denominational bags. The volunteers really appreciate the donations of coffee, sandwiches, cookies and more! We have a Facebook group for people who want to help – check the Emergency Toy Drive Facebook Group for updates! There have been several news articles about this – but here is what you need to know, for some reason there is a toy shortage and a number of local nonprofits do not have toys to distribute for Christmas. I have joined with several other Pittsburghers to address this ASAP. Friday/Saturday 12/20 – 1:00am – $5642 Raised! What we’re going to do… Collect toys and money and work with all of the organizations impacted to make sure that every need we can meet is met. we’ve set up a Crowdrise page here. All money raised on this page will be used to address the ugent need, I will provide updates here on this page as I get them. Click here to donate online. Please donate UNWRAPPED toys! We need to sort and get the right items to the right places. If we need help wrapping – we’ll put out a call for volunteers. 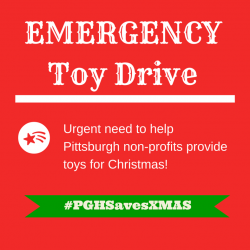 If you are an organisation that is impacted by this toy shortage and need help – please email me ASAP lindsay@iheartpgh.com. We have heard that 7 organizations are impacted by this shortage, we only know of 3. We only want to make sure that kids that need toys are able to receive a toy. Offer to be a toy drop off spot – we’re still working on the logistics – but if you have a public space and would be willing to collect toys, please let us know. Q: What happened, why is there a toy shortage. A: We’re not sure. We haven’t had a chance to get the whole story and the organizations that have been impacted are focused on an immediate solution. We know that there have been a few reports in the news. We can sort this out after we address the immediate need. Q; Why is the crowdrise an individual page, rahter than to the non-profit. A. Crowdrise cuts checks to nonprofits on the 15th of the month. Given the urgent need – we set this up in a way we can collect moneies and disperse them ASAP. Currently this is connected to my paypal account – I will provide a full accounting on funds here on IheartPGH for transparency. If you would prefer to donate directly to a 501c3 organization – we understand and are working on posting a list of those organizations. If you are a 501c3 Organization and can help us with this – please contact me lindsay@iheartpgh.com – we would prefer that all donations go directly to an organization. 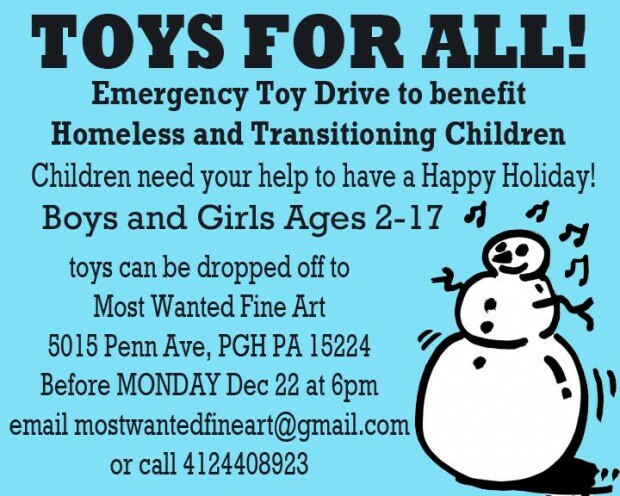 18 – # of people that have joined the Emergency Toy Drive Organizers Facebook group. We will be meeting tonight at 6pm to take inventory and get organized for shopping and delivering. Will post an update with needs later today. It is really late, but I just got home and wanted to post a quick update about today and what will happen on Saturday. First of all THANK YOU to everyone who has donated money, toys, tweets and support. The response has been incredible – $5642 dollars donated in a little over 12 hours!!! The organizing team met this evening at 6pm to map out a strategy. We are working to make sure we are in contact with the organizations that were counting on donations from Toys for Tots. One of the organizations has a toy distribution on Saturday afternoon. We wanted to be prepared, so Jennifer and Lindsay headed out to pick up gifts for teens. Everyone that we talked with – every employee at Old Navy and even the security guards were helpful. We had to stop shopping because the car was full. We’ve got a huge job to do and we are going to need your help. Can you help us coordinate efforts with others? We really want to make sure we get the toys to the organizations that need the most help. Lots of people are responding to the news – if you know of of a group that has received donations or needs donations – please let us know. Drivers/Shoppers – we think we are going to need to do a lot more shopping. This will go faster if we can have some more folks with cars come along. Tag removal – almost everything we bought today has price tags, we could use help getting those off. Larger staging area – Most Wanted Fine Art has been so incredible to step up and lend their space, but depending on how much we have donated and how much we can get out on Saturday – we may need more space. If you know of a secure space that we can use for a few days, let me know. Delivery volunteers – not totally sure what the need for this on Saturday will look like – but when we are ready to deliver the toys to the organizations we are going to need some help. If you would like to volunteer or want more updates – join the Facebook Group. We’re making a list, and checking it twice! So much goodness. Check out the article in the Post-Gazette about the response! We were also featured on WTAE last night. Have not found the clip online yet.